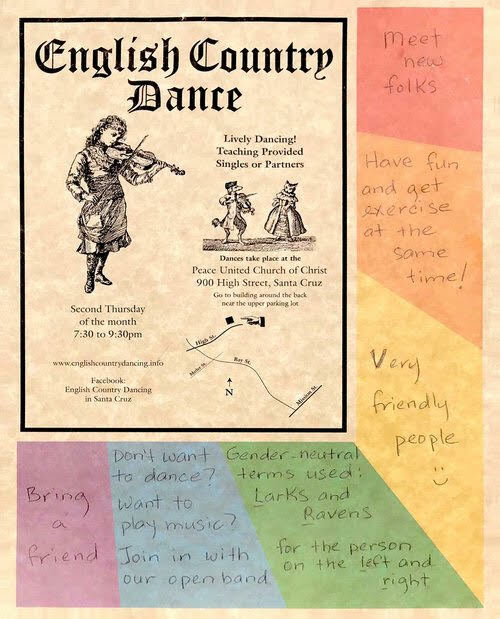 English Country Dance is the "grandmother" of Square dance and Contra dance. Instead of the traditional terms Ladies/Gents we use the gender neutral terms Larks/Ravens for the dancer role terms when teaching and calling this fun traditional dance of England. Larks=person on the Left, Ravens=person on the Right. You can dance and/or play music with our open band. Come make new friends, get some exercise, and have a lot of fun! Second Thursday of every month.